When I got home from school tonight I found an envelope from the Ocean County Artists Guild in my mailbox. It seems I finally got a response regarding the group invitational printmaking show in which I had expressed an interest in participating. 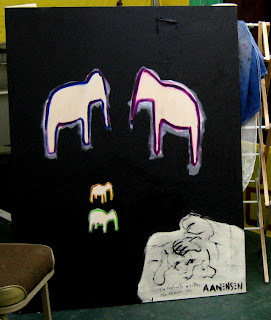 Not many details at this point- just bring 3 pieces of my choice by the end of January 2009. I don't know who else is in, or exact dates, or anything else yet. Once I know more about the dates I'll know what I will have available to put in. I'll post more when I know it. I drove up the Parkway on this cold, rainy, gray morning. The traffic wasn't as bad as it could be, but still not a great day. But that changed in an instant when I found a flyer in my mailbox about an appearance by Drive By Press, coming right to Kean University. Awesome news. I've known these guys for years, going back to my visiting artist gig at Evil Prints. And I've run across them from time to time at various places where the Outlaw Printmakers gather. The photo above is from their appearance at the 1st Prints Gone Wild Fair in Brooklyn in 2006. Drive By Press will be coming to Kean University in Union, NJ for two days- Monday, Nov 3 from 9:30 to 3:00 and Tuesday Nov 4 from 5:00 to 9:00. The events are open to all. Since I will be teaching there one of those days, I'll be able to see it and bring my class. 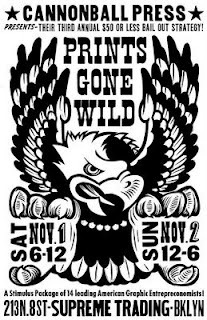 And speaking of Prints Gone Wild, the reason that the Drive By Press guys will be in NJ is because they are coming east for the latest edition of Prints Gone Wild. It's in its usual location- Supreme Trading, 213 N. 8th Street in Williamsburg, Brooklyn, just 2 blocks from the L train. The opening reception/party is on Saturday, Nov 1 from 6pm to midnight, and the fair continues on Sunday, Nov 2 from noon to 6 pm. More than a dozen print studios from around the country will be present, including The Amazing Hancock Bros, Howling Print, Bikini Press International, Sean Star Wars, and many other friends of the Outlaw Printmakers. Tons of cool prints and printed merchandise for sale, and everything under $50. That's some recession-proof art. In the afternoon I took a ride up to the Studio, going by way of Ocean Avenue in Belmar, so that I could stop by D'Jais to check on preparation for the evening's big BAC event. 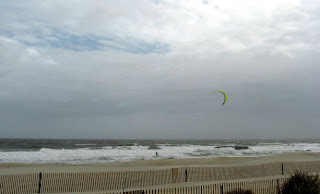 The ocean was very rough today, driven by the approaching storm. I took a few photos for possible future reference. I continued up to Ocean Grove, and put in some time continuing my box construction, this time tracing and cutting out a second exterior box for shipping Ecclesiastes prints, then assembling the first. Despite the weather I took some time to walk a little further up the coast (about 3 blocks) to Asbury Park, to check out an artists reception on Cookman at The Paint Place. 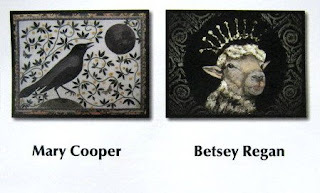 Yesterday I had been looking through the Asbury Park Press arts news and saw an image of a sheep. I thought to myself that had to be a painting from Betsey Regan, and my eyes went down to read the caption and confirmed it. I've known Betsey for about 10 years, going back to when we were both regulars at the Art Alliance co-op gallery in Red Bank, and I believe we've also shown together in group exhibitions at the Monmouth Museum and at the old City Without Walls in Newark. I haven't shown in any of those places in several years, and as a result hadn't seen her since then, and decided to go see the show and say hello. She remembered me, we had a brief chat (artists at their own receptions have many people to talk to), and talked about a future studio visit. The name of the other artist wasn't familiar, but when I saw her I realized I knew her. In fact, I had met her in the very same gallery over the summer, when she was at a reception for her friend Jill Kerwick. At the time she had expressed an interest in coming with Jill to the critique group, but circumstances haven't allowed it yet. Now I know what to expect if she does come- constructions and collages like the one seen above her name. Jill is also friends with Betsey, and has told her about the critique group, so maybe she'll join us sometime as well. 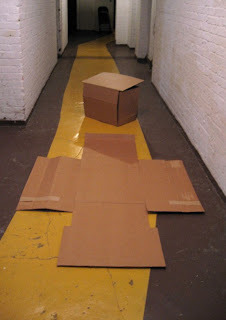 Although I said I wasn't going to post any more about my box building, I had to include the photo of the two box exteriors (one folded, one open) in the hallway. Something in the composition appeals to me. Late last week an e-mail came out from the Belmar Arts Council, requesting art donations for the upcoming annual costume party fundraiser. This had been a regular part of this event in the past, but was going to be skipped this year, until popular demand brought it back. 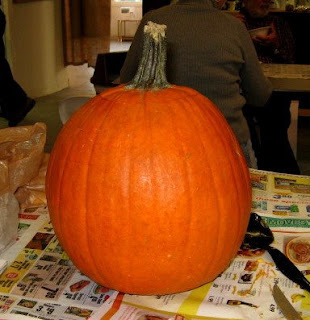 Over the weekend, while at the pumpking carving contest, I had told the BAC that I would provide something for the auction. Today I took care of that. Looking through my stock of small prints, I decided to go with a spare copy of Stopping By Jack's, a print done for the School Days group folio. This copy had some minor flaws that kept it out of the official edition, but it's still a quality piece of art. I had picked up a very inexpensive frame on my way to the pumpkin thing, and this morning I cut a mat on my homemade mat cutting machine, put it all together, and dropped it off at the Boatworks. The silent auction is part of the fundraiser, which will be held at D'jais in Belmar, Saturday October 25th, from 7:30 to closing. With the $30 admission comes hot and cold buffet, 2 drink tickets, access to the silent auction, a series of 50/50 raffles, live music, and more. For more information, or to buy an advance ticket, click here. Earlier this evening I had a lengthy phone conversation with Tom Huck. Years ago we used to do that all the time, but lately not as much, as he can be a hard man to track down. Tom is one person who can legitimately say he's busier than me. Very early in tonight's conversation he brought up something that he's said many times before- that he owes everything about his current situation as an artist to me. This is a bit of an exaggeration, but there is some truth behind it. I met Tom when we were both in Carbondale attending SIU- me as a first year grad student in printmaking, him as a senior BFA student majoring in drawing. That year he was taking a couple of printmaking classes, and I got to know him in my job as the graduate assistant in all the printmaking classes. At first our conversations were more about music than anything else; we shared of love of the Beatles, and before long I got him into blues. The bigger conversion came during the spring semester, when he was taking lithography. I won't go into all the details here, but when things were looking bleak in the litho class, I convinced him to do a woodcut instead. Perhaps not the most logical solution, but it not only helped him pass the litho class, but also got him into an MFA program as a printmaker. While he was in grad school, I encouraged him to stick with woodcut when some of his professors tried to steer him in other directions. We both graduated from our respective schools in 1995, moved back to our home areas, and started our careers as artists. Tom immediately started a series of large prints called Two Weeks in August: 14 Rural Absurdities, documenting strange but true stories about his small home town. A classic example from that series, Bed of Bones, is shown above. While he was engaged with that series, we were also working together to make names for ourselves, including organizing and participating in some group folios that were some of the first associations of what's now known as the Outlaw Printmakers. Before long, it was apparent that Tom didn't need my help with his career- his prints were being snapped up by an impressive group of public and private collections. 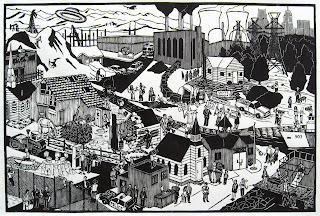 His work got bigger and better, and his reputation has grown, so now he is arguably one of the best known (or most notorious, depending on your point of view) woodcut artists in the United States. So does he owe me his career? I'll claim credit for putting him on the woodcut path and helping him stay there in the early years. But his talent, his ideas, his drive for success, his energy, his enthusiasm for his art, his willingness to put in the hours in his studio, that's all him. Of course, I'm happy to let him repay me for his successes, and he has done this time and again. His contacts have become my contacts, he's put me into shows, and several years ago brought me in as a visiting artist to his studio, Evil Prints. A lot of tonight's phone call was a discussion of the ins and outs of the academic world, but his other purpose was to bring up the possibility of having me come back out to St Louis next summer to help out with the Woodcut Bootcamp program that he runs out of his studio. I'll post more details as I know them. Tom Huck's art is not for everyone, but if that image at the top of the post has you intrigued, you should go check out the Evil Prints website and see more of his brilliant and disturbing woodcuts. Not for the faint of heart. Word got out that work on the new BAC tables would be continuing today at the Boatworks. 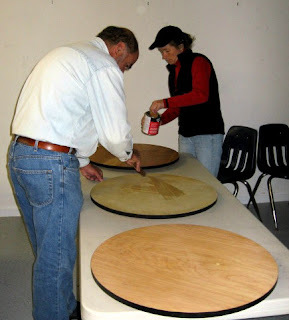 The process started over the summer when a contest was held to create art for the tabletops of a dozen round wooden tables that we use at some functions, particularly our cabaret nights. The art was done on canvas, and 12 winners were chosen for our tables. The plan is to attach those paintings to the tops of the tables. 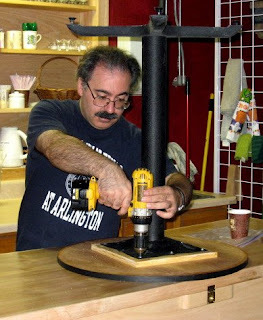 It was decided that it would be best to remove the wooden discs from the pedestal bases, so they were placed upside down on a work surface and I was handed a power drill to remove the screws. 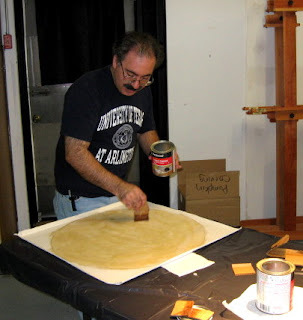 Later I was part of the crew putting contact cement on the wood and on the canvas backs. After that I had to leave to get on with other parts of my day, so I didn't see the next step of adhering the canvas to the wood. Later the canvas will be trimmed and coated with a clear acrylic to protect the surfaces. The results will eventually be posted on the BAC blog. Stopped by the Studio briefly this afternoon, where I advanced the latest box a few more steps and picked up some carving tools. Not my good woodcut tools, but rather some linocut tools, since today I wouldn't be cutting wood, but instead a pumpkin. 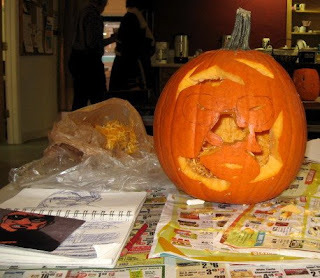 The BAC held a pumpkin carving contest and I decided to sign up. I arrived, picked out a nice pumpkin, and sat down to work. The only problem- I wasn't sure exactly what I wanted to do. I had considered cutting a scene, from art, or of local interest. One that I took as far as doing a sketch was a version of Albert Pinkham Ryder's Death on a Pale Horse, which I adapted as a woodcut previously. However, in the end I decided to adapt a different artwork- one of my own. I had a postcard version of my multi-block color woodcut Aldo Rico (partly visible in the 3rd photo), which is an adaptation of a painting from my undergrad years. That painting is based on a newspaper photograph. 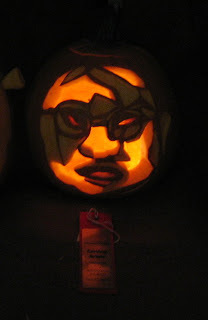 Having figured out how to break the design down into 3 basic tones, I turned my attention to the pumpkin. I cut out the top and gutted it. I started by sketching the eyes/nose area at the scale that I wanted, then used a steak knife to do rough cuts of all the areas that would be completely removed. Took a soup break (potato), then broke out my linocut tools to remove the skin from some areas, to create the mid-tones in my artwork. 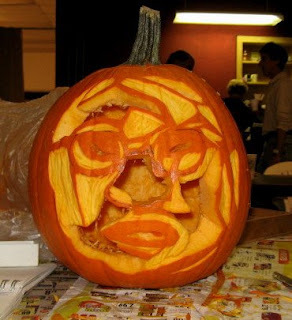 Took a chili break, then some final touches on my jack-o'-lantern. I put it on the judging table, where a lit candle was inserted. All those present voted for the best pumpkin. When all was counted, I was awarded 2nd place. 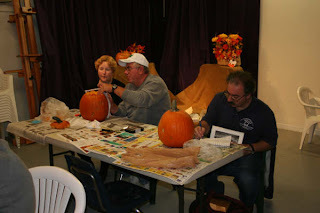 To see more pumpkins and scenes of the event, click here. Got some important e-mail from my friend in Iowa, John Siblik. He's out at Upper Iowa University, where he's been teaching for a while. We had been talking about his school hosting a show of my work for years, and we finally set things in motion earlier this year. (this is why I've been building all those boxes for the past few weeks) Today's e-mail included a proof of the postcard. I had sent him a disc with some images and he chose the one above for the card front. It's one of my best received prints and has never been on a postcard, so I think it's a good choice. The print is called A New Year for America, and it brings together news stories that happened in all 50 states a few weeks before and after New Years Day of 2003. The trick was figuring how to fit them all into the one composition. After that was the process of drawing the 24"x36" composition in reverse on the block, then cutting it all out. The whole thing took about 4 months, at the time the most I had ever spent on a single block. The original e-mail had the image of the card front (print with my name underneath), but not the card back. I left him a few messages and an e-mail about that and he found me on my cell just before my afternoon class. It's good that he did, because we were able to correct a few things from the first proof before it goes to the printer. Later in the evening he sent me the corrected version of the card back, and it looks good. I'll post it when the show is a little closer. Meanwhile I can tell you that the show is called "America" (John chose the title to go along with the image on the card, and it can apply to all the other work in the show) and will be on display from November 13th through December 18th at the Bing-Davis Memorial Gallery at Upper Iowa University in Fayette. I'll post more details when we get closer. Put in a few hours at the Studio this afternoon, putting final touches on the box I've been working on over the past week or so. I trimmed the top flaps to fit into each other, then used paper tape to clean up all the edges. I put an inner box full of framed prints inside to make sure it all fit (and it did) so this is pretty much done. Plastic sealing tape will go everywhere that paper tape is now, but that will happen later. 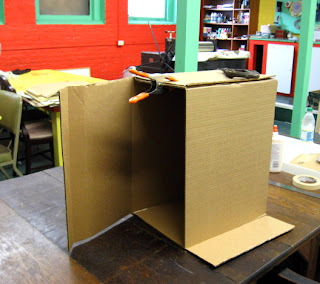 Meanwhile, a box that held a flatscreen computer monitor (found in a school hallway) turns out to be almost perfect as an outer box for the second supermarket shipping box, so I began that process as well, but I won't be devoting any more posts to the building of the remaining boxes. The construction of the outer box for the first supermarket print shipping container is almost done. 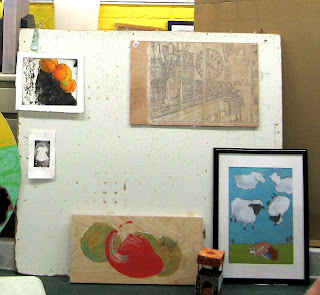 I put in a few hours (which included time spent grading and photographing some recent student drawings) at the Studio after work, during which time I attached the 6 wood panels to various inside surfaces of the outer box. All were glued and taped in place, and some also have cardboard flaps additionally securing them in place. Overnight everything will thoroughly dry. 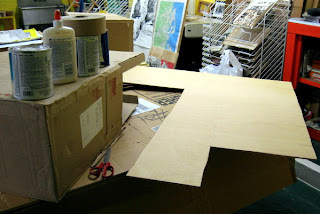 What's left is to trim the upper flaps for perfect fit, then insert the inner box and add more scrap cardboard sheets to fill any gaps. Eventually plastic sealing tape will be added at all the seams, but that may wait until I'm ready to seal up all the boxes. I was teaching at my University today, and learned that I'll be having some work on display there in early November. This is a travelling show that originated at the Printmaking Council of New Jersey this past summer, the Global Footprints show. My piece is the one shown above. More photos of art from the PCNJ show are available here. Or go here to learn the story behind this print. I'll post dates and details for the show when I know them. Special bonus- someone was throwing away a computer shipping box up on the 4th floor of my building, so I grabbed it and stashed it in my vehicle. Looks like a good size for my shipping needs, maybe only needing minor modifications. Off for the holiday, so I was able to put in a little time in the Studio. I brought back with me all the stuff I worked on in Belmar yesterday, along with some scraps of plywood. When I buy wood for woodcuts, I look for pieces that are smooth with even grain. Sometimes, there will be parts of a board (especially when I buy an 8' x 4' sheet) that are too rough to use for art purposes. I save those scraps for other projects. The irregular piece in the top photo is a remnant from which the good parts had already been removed. I marked out various rectangles and cut them out. (second photo) However, most of today's effort was devoted to taping and gluing the exterior. Cut off a few small pieces, but otherwise it's all the original large box, but now the seams and scored creases are covered with paper tape. Last photo shows where I left things today. Next time I attach the wood pieces inside, and more corrugated spacers, and I'll be all but done. 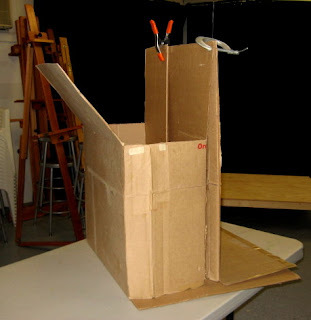 Still don't have any new art to talk about, but so you don't think this blog is only about cardboard boxes, here's a plug for someone else's, and a back story. 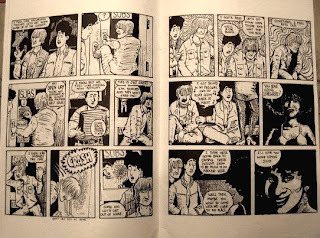 I was on my friend David Lasky's main blog the other day and saw he had a link to another blog, where he is chronicling his progress on a new graphic novel. It's called Don't Forget This Song, and is about the Carter Family singers. He's working with a collaborator, Frank Young. I don't know Young, but from what I've seen on the blog, his background is largely as a writer. Like most people in the indy comix world, Dave is both writer and artist of his work, but it's the latter that he's probably better known for. Does this mean that Frank is doing all the writing and Dave is doing all the art? Not exactly. It's possible that the finished piece may largely break down along those lines, but early on they are working on a lot of it together. For example, they are both working on thumbnails- the process of breaking down the story into panels and figuring the rough layouts of all the pages. And I'm sure both have contributed to the story. Perhaps Dave will leave a comment below clarifying things. But it also made me think of the comic collaborations Dave and I have done. Just out of college, we were both interested in making comics. I had an idea for a series, but lacked his cartooning skills. He had the opposite problem. So we decided to join forces (under the name Fistball Productions), despite living on opposite coasts at the time. I wrote a script (the mostly true story of my roommate's adventures in Italy) for a 24 page comic, and he did all the art. We shopped it around, got some nice comments, but no deals. So I wrote a second issue and sent the script to Dave, who promptly sent it back. With all the work involved in drawing a 24 page story, he didn't want to go through it again without a better story, and he wanted me to do all the rough layouts. So I rewrote about a third of it, and did the panel breakdowns (close up and long shots, positions of bodies and text, simple backgrounds) for everything. Dave was happy, did all the actual art (his skills improved since the first one), and we submitted it around. Same result. Maybe I wasn't going to be a famous comic book creator. The same week I moved to Carbondale to start my MFA in printmaking, Dave moved to Seattle and began his climb to the top of that scene. It turned out that Dave had a few ideas for stories after all, and he quickly left our earlier efforts in the dust. However, that second issue didn't go to waste- he published it a few years later as the 4th issue of his solo book Boom Boom. The top photo shows a two page spread. Dave and I have another ongoing collaboration project, a series of mini comics called Wacky Castrated Pig. (second photo, that's Wacky on the left side page) We do one whenever we are in the same place together, which isn't very often. The collaboration works differently for these. We sit down, come up with a story together. The art was split evenly as well- each doing pencils for half the pages, and inking each other's pencils. As a result, the art is a bit inconsistent from page to page, but WCP was never meant to be taken seriously. 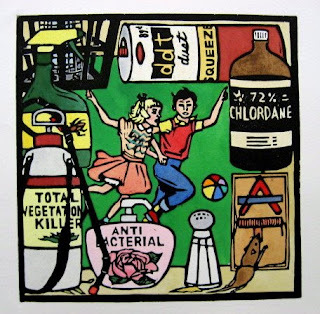 Dave and I have also collaborated on a few woodcut prints, but that's a story for another time. Still boxes today, but a change of location. I had stopped by the BAC yesterday on my way up to the Studio, and noticed that the late afternoon slot for gallery sitting was empty. This is for the Member's Salon show that's up through the end of October. I have a piece in the show, but hadn't taken any shifts yet. With no Giants game today, I figured it was a good time to take one. I know from experience that very few come to visit during gallery hours, so I brought something with me to work on, and right now that means a box. The top photo shows where I left off yesterday, raising the height of the box from 14" to about 19", by joining the top flaps together in two corners and creating a new fold line. Today I brought one of those corners in by about 4" to bring the outer box closer to the dimensions of the inner. However, that left the box still twice as big as it needed to be. I could have cut away large sections, but I wanted to keep as much of the original box structure as possible, so I came up with a different plan. (Meanwhile, one group of 4 people came through the gallery for about 5 minutes, my total visitors for the day.) A few cuts along the bottom edge, a few extra creases, and I had an accordian fold. For now I folded the extra flaps back into the box. Most will stay, some may be trimmed before I actually glue and tape it together. 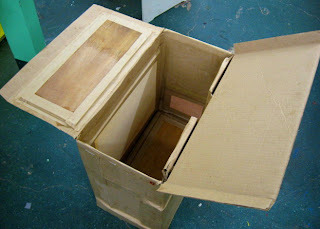 The last photo shows it with the inner box inside, and the double flaps at the top. The end of my shift had arrived, so I packed up my stuff and went home. He's not going to talk about boxes again, is he? Afraid so. I'd love to be working on my new block, but my big fall show in Iowa opens in one month, and I've got to make sure I can get the stuff there safely in time. 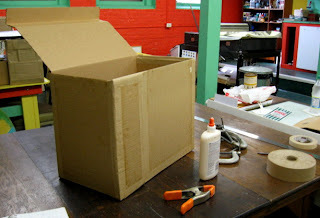 First thing after getting to the Studio was making one more inner box, a supermarket print box. Used one of my flat pieces, drew the plan just like the first one, cut, glue, tape, etc. So now all the inner boxes are done. The outer boxes are a little trickier. They have to be a little bigger than the inner boxes, and come with a double set of top flaps. 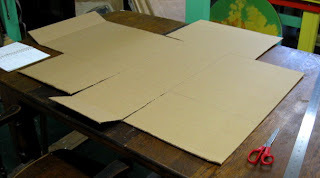 The 4 foot square flat pieces I have just aren't big enough to make that from a single piece. 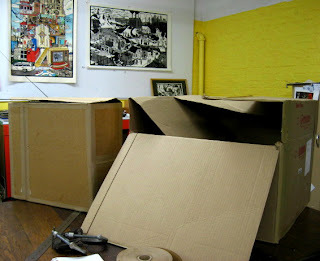 Digging around my basement at home I had found two collapsed large cardboard boxes and brought them with me today. The first was about 24" x 24" x 13", with large flaps on all sides, top and bottom. 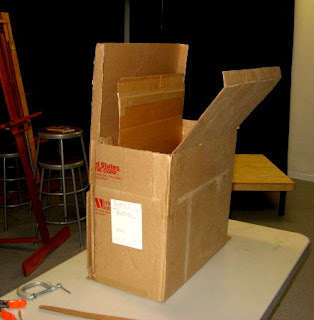 I spent some time looking at the large box, trying to come up with the most efficient way to convert it to the shape I needed. Did some sketches, figured it out. The second photo shows the start of that process. Very slow going- can't really just create a pattern, but rather I will be cutting and folding it one piece at a time, essentially wrapping it around the inside box, while leaving just enough space for the protective panels. Didn't get very far today before it was time to quit, but I have a plan, so I should finish this box on my next visit. 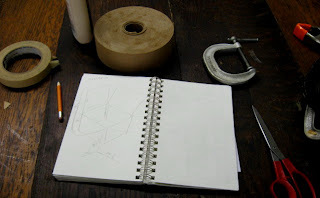 Back to the Studio for a short visit this morning, to start another box. This one is to ship some prints from the Ecclesiastes series. When I started the series several years ago, I stored and carried the first dozen or so in a cardboard orange crate. When I outgrew that, but needed to safely store more, I made a custom box that held around 10 framed pieces. 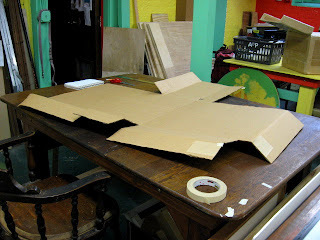 This single cardboard box with a lid is the equivalent of one of my inner boxes, and with no pressing need, I had never made the outer shipping shell. That has changed. But for today, another inner box. I used the first one to get the needed measurements, and plugged those numbers into the flat box pattern I designed yesterday. Laid it out, cut, and scored it. 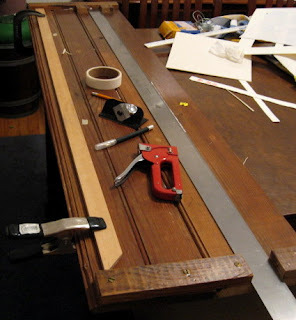 (top photo) Next was assembly, using wood glue (which is strong and grabs fast) and clamps. (middle) Last was putting paper tape on every joined and scored seam in the cardboard, to strengthen the seams and tighten it up. (last photo) Yesterday it took about 2.5 hours to get that far, but today less than an hour, thanks to being able to use a predetermined pattern. That left me enough time to do my weekly food shopping and still be home in time for the start of the Giants game. I'd love to get back to my latest block, but with the show in Iowa coming up in just about a month, I have to start some of the time consuming preparations. 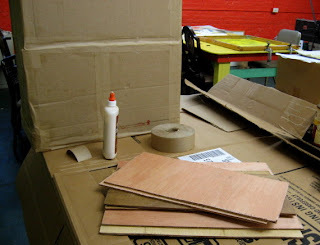 The most important of those is building boxes to ship the work. This will be my largest ever shipping effort. 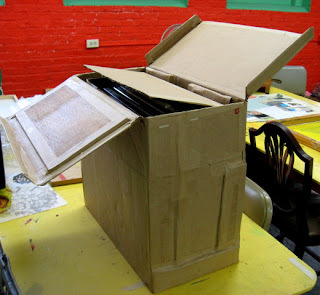 I started building custom shipping boxes as far back as 1995, when I had to mail a framed print from Carbondale to Evanston for a juried show. That one box made trips all over the country over the next few years, along with several others made in subsequent years. These were all designed to hold one or two framed prints. The philosophy behind my shipping boxes is that I can't control what happens to them after they leave my hands, so I make them as strong and secure as possible, to make sure that my art arrives on time and intact. These early boxes all included double wall construction (inner and outer boxes each with its own closing end flaps), often were lined with bubble wrap, yet designed to open easy on one end. Then came 2001, when I had been offered a small solo show at a school in Florida. They wanted 16 prints from my saint series. So I built two larger boxes, each designed to hold 8 framed prints. The top photo shows one of those boxes. 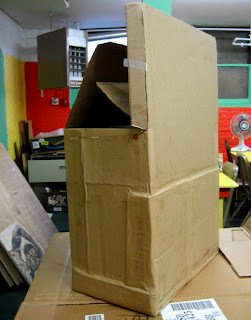 A double strength inner corrugated box, held within a double layered outside box, with additional cardboard and panels of scrap lauan secured in between. The 8 framed prints were individually wrapped in bubble wrap with sheets of corrugated in between. 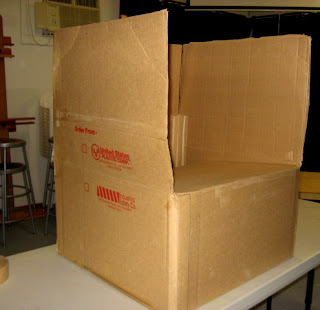 The inner box had a closing flap, and the outer box had two closing flaps. Closed the lid and sealed with tape. The gallery director in Miami, the late Fr. Jorge Sardinas, was amazed by these boxes- strong, easy to open, and not a single styrofoam peanut to clean up. In fact, he even brought one out during the reception to show everyone this box I had used to send the work. Those boxes will be used again this time, but now I also have to ship another 30 or so prints from two additional series. I have boxes for these that are fine for when I carry them to shows myself, but now I need something much stronger. It had been so long since I made those saint boxes, I brought one with me to the Studio, to refamiliarize myself with how I did it. I have several large sheets of cardboard scrounged from one of my jobs, which I've been saving for this occasion. Measured one of the frames from my supermarket set, and used that to figure the inside dimensions of my inner box. That scored and cut piece is what's shown in the second photo. The initial calculations took a while, so today I only got as far as assembling that one inner box, but I have extensive notes and diagrams of what I did today. Just need to copy what I did today for a second one, and change a few numbers to come up with the measurements for two boxes for Ecclesiastes prints. More of a problem will be the outer boxes, since they will require larger pieces of cardboard than the ones I have, if I want to make the outer box from one piece, and that is my preference. I've got time to track those down. Today I finally took care of something I had promised to do a few weeks ago. 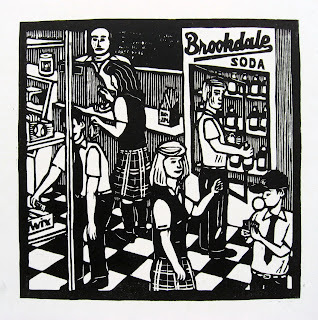 I had gotten an e-mail from Breanne Trammell, an artist with a lot of printmaking experience and one of my biggest fans. 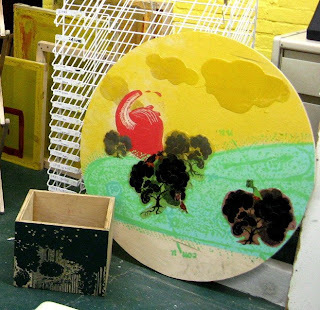 She has gotten involved with a non-profit printmaking center in East Harlem called Stickball Printmedia Arts. The studio has a nice assortment of printmaking equipment, plus some papermaking and digital equipment, all dedicated to local youth programs. Breanne put out a call requesting print donations for an upcoming fundraiser, and I'll donate a piece to such things from time to time. 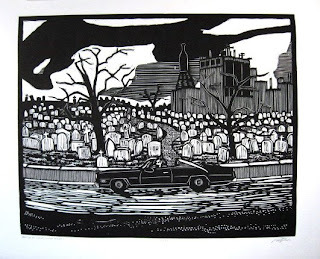 At first I was going to send something small, but I decided to go with a larger piece, the Death on the Highway print that I produced in St Louis a few years back. I still have many copies left, it has brought in good money in previous fundraisers, and I figured it's a good image in the Halloween season. 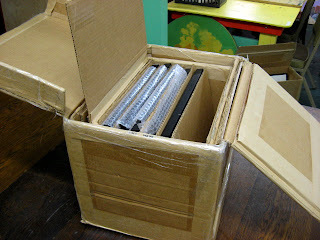 Yesterday I bought a mailing tube and packed it, but didn't have time to send it out. That happened today. The fundraiser itself will be at the Stickball Printmedia studio, 433 E. 100th St. (near 1st Ave) on Thursday, October 16, from 6:30 to 9 pm. There will be cocktails and hors d'oeuvres, demonstrations of print techniques, as well as prints from students and from professional artists (including Outlaw Printmaking associates Nancy Palmeri and Dennis McNett). The event is to benefit artistic and educational programs at Stickball. More information about the studio and the event is available on their website. 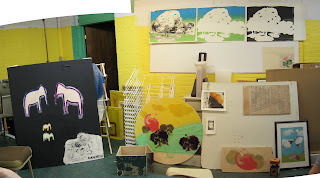 Last month the group consisted of me and three brand new visitors to the Studio. None of those people were there this time (though there are hopes that some of them will be back in the future), but we had a bunch of our regulars in attendance. I showed my current block and explained the new series, since no one there heard my story last time. People seemed to like my idea for the series, and this piece so far. Molly had a bunch of things to show- a table in progress, some tree drawings/prints, some smaller experimental pieces, and a carved box. Mary brought a couple of etchings (peaches and dress) that she's been working on. She also brought a new participant, her friend Laura, who showed a cool pastel drawing (the one with the sheep). And Tim, who always surprises us, brought his large elephant painting. Click on the photos to see larger views of all the works. Lots of fun as always, with some potentially good ideas coming out of it. Maybe some of the resulting work will be shown next time- Wednesday, November 5, from 7 to 9 pm.